Burnley have gone back to basics to regain their renowned defensive solidity. Sean Dyche’s side have shipped 25 goals in 12 Premier League games so far this term, only 14 fewer than they did all last season. They had the fifth best record in the league last year as they finished seventh, and Dyche hopes that the clean sheet at Leicester City on Saturday – a first in six games and only a third this term – is something to build on. Asked whether he has had to go back to basics with his players, after conceding 13 goals in the previous three games, Dyche said: “Back to basics isn’t glib, it’s relevant, because we had to look at that – do you run before you can walk? “Let’s walk first, make sure we’re doing all the fundamentals of what the team does to operate, to get back to a performance. “There were some not there, there’s still more to come, but it was more solid, the organisation, the shape, the energy of the team, the will, the desire, all the things we’re well respected for. “And there were some good moments of play as well, I still think we can improve with the ball, I still think we can add that cutting edge, when we get in the top third. “We got into some really good positions, and didn’t quite find that pass or that touch, so that can come, but there are good signs, and I’m very pleased with the players. 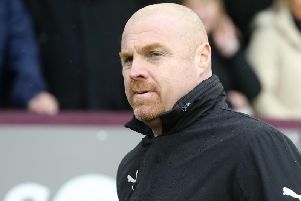 Dyche had spoken before the game about his belief that his players were not far off returning to their normal levels, despite three-successive defeats, and he reiterated: “There have been a few reminders about the organisation of the side, reminders of what we’re about, and the players also, their responsibility, their feedback. “The thing about football is, I’ve said this all season, we’re not where we were, but we are getting there. “The margins are not as big as you think sometimes, they’re super-tight. “You do sometimes forget that. “There was a stat, about the main top six, if you like, the top five and add Manchester United into that... and the points they had taken against teams outside that (the ‘Big Six’ have now taken 127 of 135 points available against the other sides this season). “You’ve got to be realistic, and that doesn’t mean you accept it, but you’ve got to accept some days it is going to go against you, and some days it might be back to back when it goes against you.